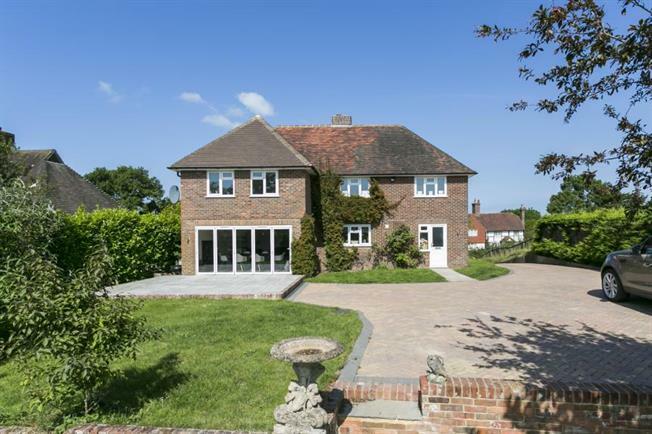 5 Bedroom Detached House For Sale in Heathfield for Guide Price £750,000. The ground floor consists of a handy utility/boot room and an exceptionally spacious open plan kitchen/diner & living area, fitted with high end appliances including microwave oven and wine cooler. Bi-fold doors lead out to a paved patio area overlooking the lawned garden and fields beyond. There is additional reception space currently set up as an office which could also function as a children's playroom or snug. With whitewash walls and wooden floors downstairs and cream / neutral carpets upstairs, the property is bang on trend offering contemporary lifestyle within an attractive rural setting. Upstairs there are five spacious bedrooms, with luxury re-fitted family bathroom and en-suite to the Master. The property is fronted by an attractive green with mature trees offering seclusion. A paved driveway running the side of the plot leads to a parking area for a number of vehicles. The rear gardens offer a balance of maintainable space with an open outlook to rural farmland and rolling countryside views. Situated just a short walk from the picturesque village green and amenities of one of Sussex's most desirable locations…Rushlake Green. Offering a post office/general store, popular public house with exceptional restaurant reviews, church and village hall. The market town of Heathfield is around 5.5 miles northwest, providing a wide range of facilities including banks, coffee shops, various supermarkets and eateries. The spa town of Royal Tunbridge Wells and the coastal resort of Eastbourne are within 16 & 14 miles respectively, both offering an excellent range of schools, recreational facilities and transport links to London.